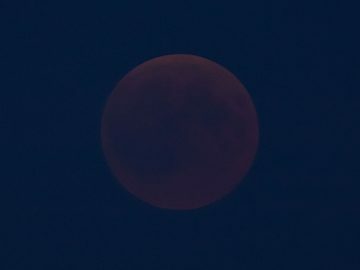 While eclipses of all sorts happen throughout each year – from “blood moons” to annular solar eclipses, total eclipses and every partial one in between, this year’s lunar eclipse promised something special: the longest lunar eclipse in the 21st century. So the call from Rollei came – could I come across and be involved in their live shoot on Instagram, capturing the spectacle from Hamburg? With a few days’ preparation beforehand and a couple of challenges finding an accessible location with the right line of sight (plus the potential for a cloudy night) Friday 27th July 2018 had finally arrived. 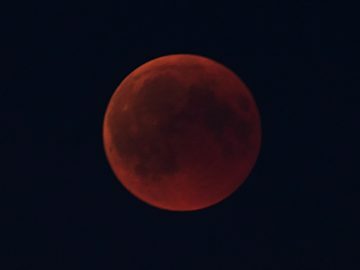 So, what were we looking for, in order to capture the moon in it’s “blood red” form? 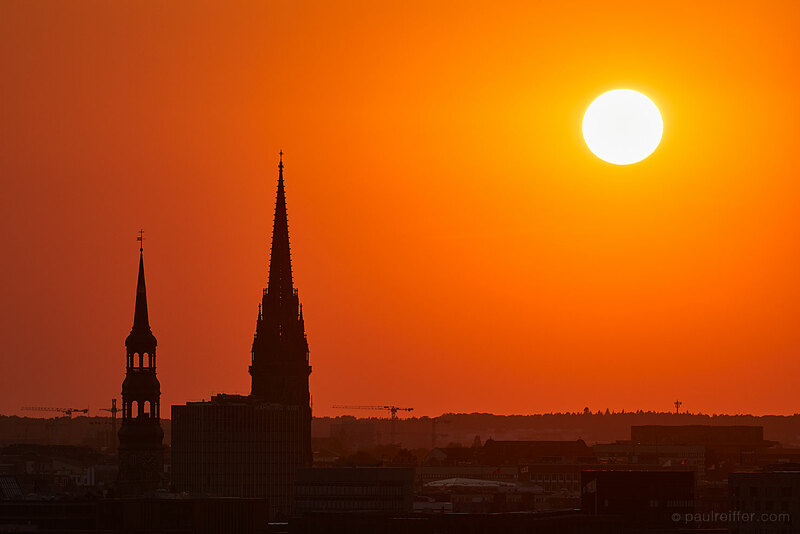 Even on the back of the camera, that shot brought a smile to my face – so clean, crisp, and iconic with the famous churches of the Hamburg skyline in shadow against the setting sun. Well, that was one in the bag already – even if the evening turned to disaster, it was worth the walk around the rooftop to see that anyway! Well, no, actually – 2018’s lunar eclipse actually had the moon quite some distance away from the earth, so not ideal. Future ones may well be better. It initially looked that way, but the haze on the horizon soon turned into a wall of thin cloud during sunset. Sadly, in summer, that’s not really an option in the northern hemisphere, plus the eclipse was due to start less than an hour after sunset. In this case, the trusty Canon 5D mkIV was the camera of choice – It’s a great all-rounder. Some might have considered a cropped sensor APS-C camera (to boost the lens by 1.6x) but I was happy with this option. My Phase One kit, while fantastic at almost everything else I shoot, would have struggled at the extremely high ISO’s needed for this (more on that later). With the difference between the f/2.8 version of Canon’s 400mm EF lens and the f/4 DO version being $10,000 vs $6,000, we opted for the slightly cheaper one to use tonight(!) – after all, these images weren’t really for printing, it was more about the experience and live shoot. Adding the 1.4x v3 extender pushed that to a 560mm f/5.6 lens on a full frame body. Forget anything worse than f/5.6, however, you’ll just end up frustrated. Back to our view and my normal happy feeling when the sky goes pink, in this case, turned to frustration – the pink in the sky comes from moisture bouncing the sunlight back, and moisture (as above) is not our friend when shooting at night. We got to the point of false sightings, just to keep our humour levels up – this was looking like a bust. But then just as we were discussing packing up for the evening (facing away from the moon), and only 10 minutes before “totality” should be occurring, our hotel guy’s eyes lit up: “Isn’t that it, just starting to appear over there?” He said. Soon enough, the moon rose just enough to free itself from the haze across the horizon. With the changing contrast and effect of the eclipse itself, this was a game of chasing sharpness, without sacrificing light. Clicking away, there was also the issue of how fast the moon was moving – especially given the long focal lengths. As the sky was getting darker, leading to more contrast with the moon itself, the temptation to slow down shutter speed started to kick in. Even a 1.3 second exposure was way too long, resulting in a blurry image as the moon passed through the tight frame quicker than I’d hoped for. Settling at 0.8 seconds, we’d hit that moment of total lunar eclipse, and finally things had started to come good. Granted, I’d have liked the moon a lot closer to the Earth than it was on this occasion, but looking at the back of the camera, I knew a few of these would be just fine. Mars even made an appearance (on the right, taken from the back of the camera). Yes, if you thought the moon was tricky to capture, without a 4,000mm lens/telescope, that just wasn’t going to happen. As the light from the sun began appearing again on the left hand side of the moon, it was easy to see how quickly the lighting changed through the viewfinder. 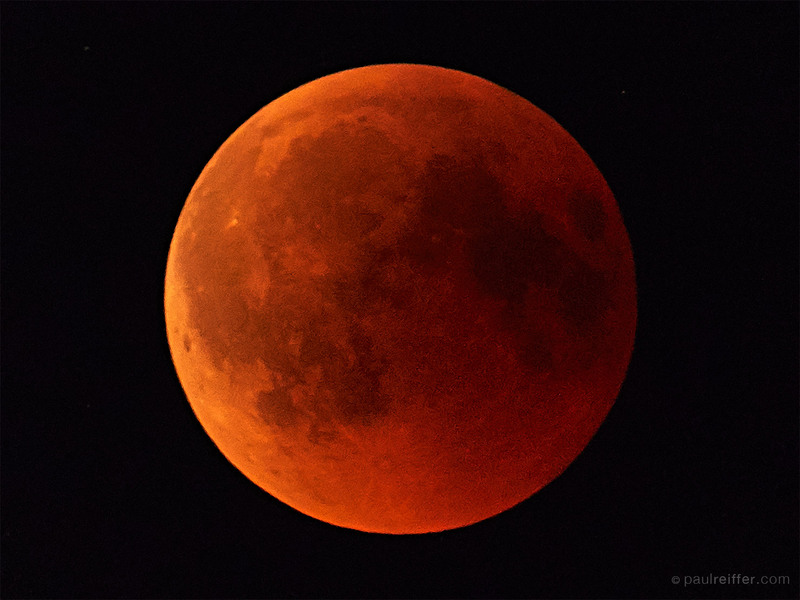 Our “blood moon” was rapidly becoming “just a moon”, and frames even 5 seconds apart showed signs of difference from one moment to the next as the red began to fade to yellow. What began to feel like failure, soon turned to success – thanks, in part, to the cloud staying put, but in no small way due to our newly recruited moon-spotter at the hotel. 10/10 for that help! Overall, however, I can’t help but feel the evening fell short of its own hype. An earlier darker sky, would have been great. The moon being closer to earth, would have been better. Not stood in 34ºC heat for 4 hours, would have been fantastic too! But all that aside, when you look up and see that glowing red disc instead of the “standard moon”, you can’t help but be impressed by how great our solar system truly is. Want to try and capture the next lunar eclipse yourself? It’s due on January 20th-21st 2019, and will be visible from the UK as well as the entire North and South American continents – check out timeanddate.com for more info! Light Pollution, Astroklar & Natural Night Filter Review - Do They Really Work?